The production of true tequila is limited to only five Mexican states. The states that comprise this denomination of origin are Jalisco, Michoacan, Nayarit, Guanajuato, and Tamaulipas. The red volcanic soil that can be found in the tequila-producing region of Mexico lends itself well to the growing of blue agave plants. Those plants that are grown in the highlands tend to be larger and have a sweeter taste, while those grown in the lowlands are typically smaller and more herbaceous. Mexican law deems that tequila must be distilled at least twice before it can be sold and consumed. Most tequilas are 80 proof, which translates to an alcohol content of 40 percent. There are variations, and some tequila can be even be up to 110 proof. Tequila is grouped into two basic categories. It is either 100 percent agave tequila or "mixto" tequila. To create a mixto variety, producers mix at least 51 percent agave sugars with other sugars, such as glucose and fructose. The 100 percent agave-based tequila is the best you can buy. Tequila as we know it today was first produced in Mexico in the 16th century. The country was then under Spanish rule. Prior to the arrival of the Spanish in the 1500s, the Aztec people had already figured out a way to make a fermented beverage from the blue agave plant. This beverage was originally known as "octli," and then by the more common name "pulque." The Spanish settlers only began to take an interest in pulque when their brandy supply began to run out, and not long thereafter, they went on to distill their own version of blue agave spirits - or tequila. In 1758, a man by the name of Jose Antonio Cuervo established the first official agave farm in Mexico's Jalisco region, and in 1795, the Cuervo family was awarded the right by the Spanish Crown to begin producing tequila on the commercial level. To this day, the general Jalisco region is where all true tequila comes from, and there is even a Jalisco city that is named Tequila. 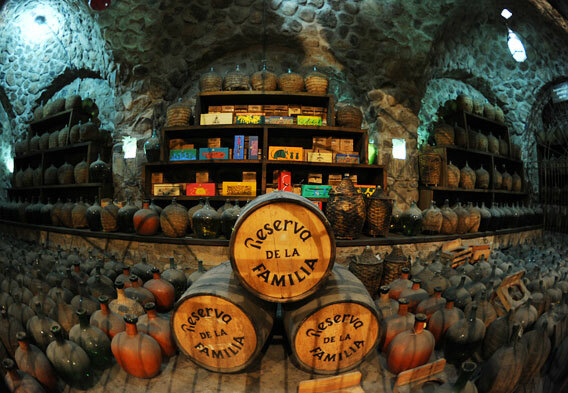 The area in and around Tequila is home to the original Jose Cuervo distillery, as well as several other distilleries, and it has been designated as a UNESCO World Heritage Site. There are modern distilleries glistening with shiny stainless steel equipment, as well as many small family-run distilleries called "fabricas." As in the regions of Champagne and Cognac in France, true tequila must come from this region to be certified. In addition to the small fabricas, many companies contract with local artisans who create wonderful hand-blown glass and Talavera pottery bottles, which have become collectors' items. The process of making tequila is a rather laborious one. 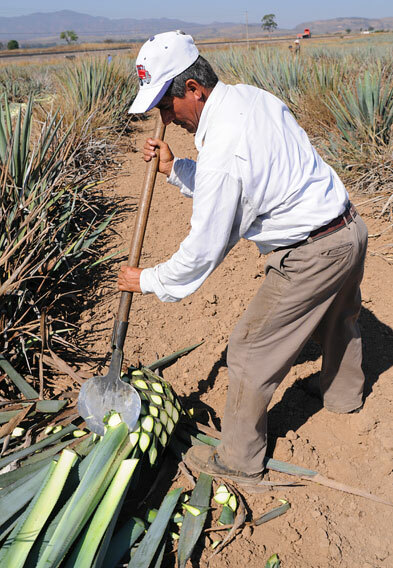 First, workers who are known as "jimadores" must harvest the agave plants that will be used to make the famous beverage. Generally, an agave plant grows for eight to 10 years before being harvested for this purpose. Once the plant is chosen, workers use an age old tool that is known as a coa to get to its core, which is known as a pina. The pinas can weigh up to around 155 pounds, and once they are cleared of leaves and thorns, they are either cut into halves or quarters and then cooked. Special ovens are used to cook the halved or quartered pina pieces, and this process allows the natural starches to turn into sugars. After this, the pinas are shredded and their juices extracted. The juice is then put into tanks or vats so that the fermentation process can begin. During fermentation, yeasts are introduced and the blue agave juice is lightly heated so that carbon dioxide can be released and alcohol produced. Subsequent to this, the distillation process begins. To distill, the fermented agave juice is heated to the vaporization point for alcohol and then cooled and condensed. After being distilled once, the resulting product is known as "ordinario." The cloudy ordinario is then distilled itself to create a clear, more refined product referred to as "plata," or silver tequila. The process of fermentation and distillation will take between a couple days and two weeks, depending on the climate. Distilled tequila musk be aged in oak by Mexican law, although some may be bottled immediately. Basically, the aging process creates smoother and more complex tequila. The oak casks are allowed to rest for between a year or as long as 10 years. The longer it is aged, the better the quality. 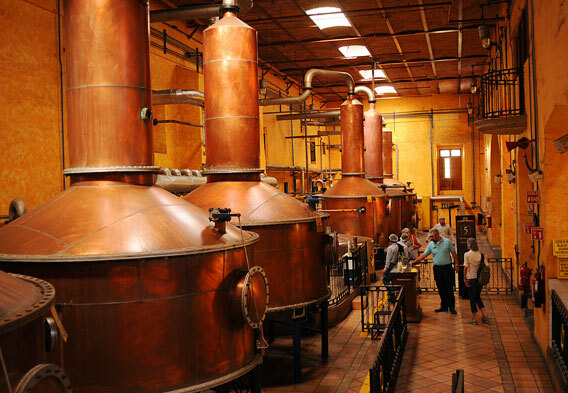 You can learn all about this process by taking a tour of the Jose Cuervo distillery in Tequila. Tours are available in English, and many are conveniently arranged in the larger city of Guadalajara, which is approximately 30 miles southeast of Tequila.